To Cite: Bokharaei-Salim F, Salehi-Vaziri M, Sadeghi F, Esghaei M, Monavari S H, et al. 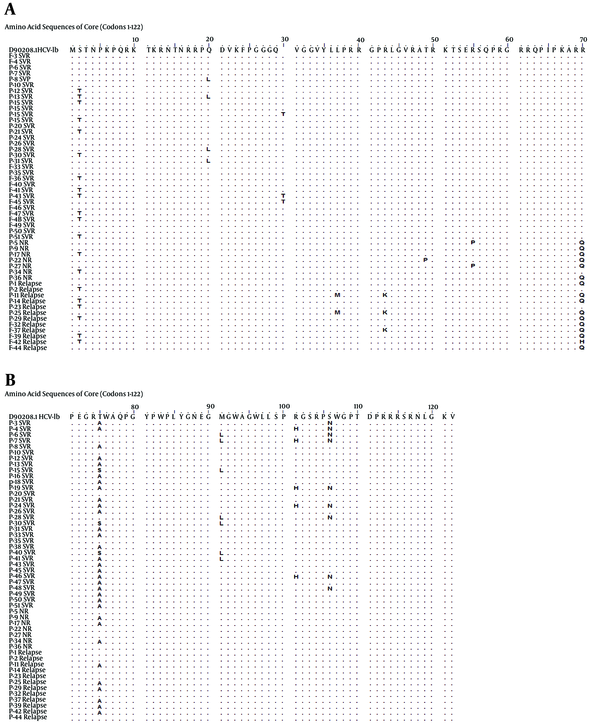 The Association of Substitutions in the Hepatitis C Virus Subtype 1b Core Gene and IL28B Polymorphisms With the Response to Peg-IFNα-2a/RBV Combination Therapy in Azerbaijani Patients, Hepat Mon. 2016 ; 16(5):e35597. doi: 10.5812/hepatmon.35597. Background: The hepatitis C virus (HCV) infection has been identified as a leading cause of progressive liver diseases worldwide. Despite new treatment strategies, pegylated interferon alfa-2a (Peg-IFNα-2a), in combination with ribavirin (RBV), still represents the gold standard of therapy for hepatitis C in developing countries. Objectives: The aim of this study was to investigate the association of substitutions in the HCV subtype 1b (HCV-1b) core protein and the rs12979860 polymorphism in the interleukin 28B gene (IL28B) with the response to Peg-IFNα-2a/RBV combination therapy in Azerbaijani patients. Patients and Methods: A total of fifty-one chronically HCV-1b-infected Azerbaijani patients were enrolled in this cross-sectional study from March 2010 to June 2015. After RNA extraction from pre-treatment plasma, the core region of the HCV genome was amplified using the nested reverse transcription (RT) polymerase chain reaction (PCR) method, followed by standard sequencing. In addition, genomic DNA was extracted from peripheral blood mononuclear cell (PBMC) specimens, and the rs12979860 single nucleotide polymorphism (SNP) was identified using a PCR-restriction fragment length polymorphism (PCR-RFLP) assay. Results: In this study, a significant association was observed between the non-responders and relapsers to antiviral therapy and substitutions in the HCV-1b core region at positions 43 (R43K, P = 0.047), 70 (R70Q, P < 0.001), 91 (M91L, P = 0.037), and 106 (S106N, P = 0.018). Concerning the IL28B polymorphism, the results showed that sustained virological response was significantly associated with homozygous CC patients (P = 0.009) as compared with other genotypes, while homozygous TT subjects were associated with HCV relapse after therapy (P = 0.006). Conclusions: The data of the present study suggest that amino acid substitutions at position 43, 70, 91, and 106 in the HCV-1b core protein are correlated with the response to the Peg-IFNα-2a/RBV treatment in Azerbaijani patients with chronic hepatitis C. Moreover, host genetic polymorphisms, such as those of the IL28B locus, might be useful for predicting the responsiveness to Peg-IFNα-2a/RBV combination therapy against HCV. The hepatitis C virus (HCV) infection has been identified as a leading cause of progressive liver diseases, including cirrhosis and hepatocellular carcinoma (HCC) (1). Despite the emergence of new treatment strategies for chronic HCV infection (2), pegylated interferon alfa-2a (Peg-IFNα-2a), in combination with ribavirin (RBV), still represents the gold standard of therapy in developing countries such as Azerbaijan. The response rate to this treatment remains unsatisfactory, particularly in individuals infected with the HCV genotype 1b (HCV-1b), which represents the predominant genotype among Azerbaijani patients (3, 4). Several host and viral parameters have been associated with the response to interferon-based antiviral therapy. Representative host factors include age, gender, ethnicity, body mass index (BMI), grade of liver fibrosis and single nucleotide polymorphisms (SNPs) in the IL28B gene (5, 6). Viral factors include HCV genotype, serum viral load, coinfection with human immunodeficiency virus (HIV) and substitutions in the core and NS5A region (7-10). Numerous reports indicate that the substitution of arginine (R) with glutamine (Q) at amino acid position 70 (R70Q) of the core protein is significantly correlated with a poor virological response to the Peg-IFNα-2a/RBV therapy in patients infected with HCV-1b (11, 12). In addition, it has been suggested that core 70 polymorphisms can be used as predictive factors for the outcome of this combination treatment (13). However, to date, the occurrence of core 70 substitution, and its association with treatment response, has not been evaluated in Azerbaijani patients infected with HCV-1b. Therefore, this deserves further investigation. In addition to viral genetic variations, IL28B SNPs represent important host-related factors affecting the response to Peg-IFNα-2a/RBV therapy (14, 15). In particular, patients carrying the IL28B SNP rs12979860 CC genotype appear to respond better to the antiviral therapy than those with the rs12979860 CT/TT genotype (16, 17). Evaluation of both viral and host factors (variations in HCV core 70 and IL28B rs12979860 polymorphisms) in pre-treatment samples of Azerbaijani patients infected with HCV-1b can be informative in predicting the outcome of the therapy. The current study aimed to investigate the association between the HCV core substitutions and the IL28B rs12979860 polymorphisms with the response to Peg-IFNα-2a/RBV therapy in Azerbaijani patients chronically infected with HCV-1b. Fifty-one chronically HCV-1b infected Azerbaijani patients were enrolled in the current cross-sectional study between March 2010 and June 2015. These patients arrived in the Islamic Republic of Iran for medical treatments from the Republic of Azerbaijan and were visited in hospitals affiliated with the Iran University of Medical Sciences. Patients aged over thirteen years, and with HCV RNA levels in their plasma ≥ 450 IU/mL for a period of six months prior to the present study, were considered eligible. Patients co-infected with HIV or hepatitis B virus (HBV) were excluded, as were subjects affected by HCC, liver dysfunction, liver transplants, decompensated liver disease, poorly-controlled psychiatric diseases, creatinine clearance rate of 50 mL/minute, malignant neoplastic disease, active substance abuse, severe cardiac or chronic pulmonary disease, or poorly-controlled diabetes (18). This study was approved by the ethical committee of the Iran University of Medical Sciences (Tehran, Iran). All patients provided written informed consent prior to study participation and were treated with a combinational therapy of RBV (1,000 - 1,200 mg/day) (Copeguss, Roche, Basel, Switzerland) and Peg-IFNα-2a (180 µg/week) (Pegasyss, Roche, Basel, Switzerland) for 48 weeks. Patients with sustained virological response (SVR), such as those displaying undetectable HCV RNA levels at the end of the therapy and during the six months follow-up period, were defined as responders. Patients whose HCV-RNA levels were still detected at the end of the antiviral therapy were considered non-responders (NR), while those who had undetectable HCV-RNA levels at the end of treatment, followed by a reappearance of viremia over the six months follow-up period, were designated as relapsers. Both non-responders and relapsers were considered non-viral response (NVR) patients. Finally, patients with undetectable HCV RNA levels at 12 and 4 weeks of treatment were defined as early viral response (EVR) and rapid viral response (RVR), respectively (19, 20). At the beginning of the treatment, approximately 5 mL samples of whole peripheral blood were collected from each patient and kept in sterile vacutainer tubes containing ethylenediaminetetraacetic acid (EDTA). Following plasma separation, peripheral blood mononuclear cells (PBMCs) were isolated from peripheral blood using Ficoll-density gradient centrifugation (Lympholyte H, Cedarlane, Hornby, Canada). After three washes with phosphate-buffered saline (pH = 7.3 ± 0.1), PBMCs were counted, resuspended in 200 μL RNAlater solution (Ambion, Inc, Austin, Texas, USA), and stored at -80°C until use. HCV viral load was assessed using the COBAS TaqMan HCV Test v2.0 (Roche Molecular Diagnostics, Mannheim, Germany) real-time PCR. HCV genotyping was carried out using restriction fragment length polymorphism (RFLP) assay of the 5′ noncoding region (5′-NCR) of the viral genome, according to a previously described protocol (22). The HCV core region (nucleotides 340 - 682) was subjected to nested PCR using the following primers: outer sense 274F (5′-AAGGCCTTGTGGTACTGCCTG-3′), outer antisense oka186R (5′-ATGTACCCCATGAGGTCGGC-3′), inner sense 318F (5′-GGAGGTCTCGTAGACCGTGCA-3′) and inner antisense 709R (5′-GACCTTACCCAARTTMCGCGACCTA-3′) (23). The first and second rounds of nested PCR were carried out in a 25 µL mixture reaction containing 1.0 U of Ex Taq DNA polymerase [TaKaRa Biotechnology (Dalian) Co., Ltd., Shiga, Japan], 2.5 µL of 10X Ex Taq buffer (Mg2+ free), 2.0 µL of MgCl2 (25 mM), 2.0 µL dNTPs Mixture (25 mM each) and 10 pmol of each outer primer. In addition, 2.5 µL of DNA was added to the mixture for the first round of nested PCR while, for the second one, 2.5 µL of the resulting PCR product was used as a template. For the first round, PCR conditions were as follows: initial denaturation at 95°C for 5 minutes, 35 cycles of 30 s at 95°C, 45 s at 60°C, and 60 s at 72°C, followed by a final extension of 7 minutes at 72°C. The second round of PCR was conducted as follows: initial denaturation at 95°C for 5 minutes, 35 cycles of 30 s at 95°C, 30 s at 60°C, and 50 s at 72°C, followed by a final extension of 7 minutes at 72°C. The second round PCR products were puriﬁed using the high pure PCR product puriﬁcation kit (Roche Diagnostic, Mannheim, Germany), according to the manufacturer’s instruction. Next, the samples were sequenced bi-directionally, according to the dye termination method, using the ABI 3730 XL sequencer. The sequences of the HCV Core region were determined from the pre-treatment plasma of the fifty-one Azerbaijani patients with chronic HCV-1b infection. Genomic DNA was extracted from PBMC samples using the QIAamp DNA blood mini kit (Qiagen GmbH, Hilden, Germany), according to the manufacturer’s instructions. Genotyping of the IL28B rs12979860 C/T polymorphism was conducted using PCR-based RFLP assay as described previously (24). A consensus sequence of the core region was generated by aligning all of the nucleotides encoding the core amino acid residues obtained from the current study to the HCV-1b reference genome (GenBank accession number D90208), using MEGA software (version 6.0). The phylogenetic tree of the core amino acid residues (codons 1 - 122) was inferred by aligning the sequences obtained from the pre-treatment plasma samples of responders, non-responders (NR) and relapsers with the HCV-1b reference genome according to the Neighbor-Joining method, using MEGA software (version 6.0) (Figure 1). Statistical significance of the phylogenetic trees was assessed using the bootstrap method (one thousand replicates). The nucleotide sequences of the HCV-1b core region presented in this study were submitted to GenBank, and will be available with the accession numbers KT329291 to KT329341. All calculations were performed using the SPSS software package (SPSS Inc., Chicago, IL, USA). The normality of the data was assessed using the Kolmogorov-Smirnov test. The analysis of continuous variables was carried out using the One-way ANOVA and the Kruskal-Wallis tests. The χ2-test was employed to evaluate the associations between categorical variables. A P ≤ 0.05 was considered statistically significant. Fifty-one Azerbaijani patients, chronically infected with HCV-1b, were enrolled in this prospective study. The mean age of participants was 39.6 ± 10.6 (range 20 - 58 years). Twenty-two (43.1%) out of fifty-one patients were male. The demographic features, laboratory parameters, and different responses to the Peg-IFNα-2a/RBV combination therapy (responders [n = 32, 62.7%], NR [n = 7, 13.3%], relapsers [n = 12, 23.5%]) are summarized in Table 1. Significant differences were observed in terms of gender (P = 0.018), viral load titer (P = 0.020) and aspartate aminotransferase (AST) level (P = 0.024) but not for age (P = 0.547) or alanine aminotransferase (ALT) level (P = 0.992) (Table 1). The core region of HCV-1b was amplified, sequenced and aligned with the HCV-1b reference genome (GenBank accession number D90208) (Figure 1). In the present study, a significant association was observed between the outcome of the antiviral therapy and amino acid substitutions in the HCV-1b core region at positions 43 [arginine (R) to lysine (K), P = 0.047], 70 [R to glutamine (Q), P < 0.001], 91 [methionine (M) to leucine (L), P = 0.037], and 106 [Serine (S) to Asparagine (N), P = 0.018]. In contrast, no association was observed between the outcome of the Peg-IFNα-2a/RBV treatment and amino acid substitutions at residues 20 [Q to leucine (L)], 30 [isoleucine (I) to T], and 101 [R to Histidine (H)] (Table 2). 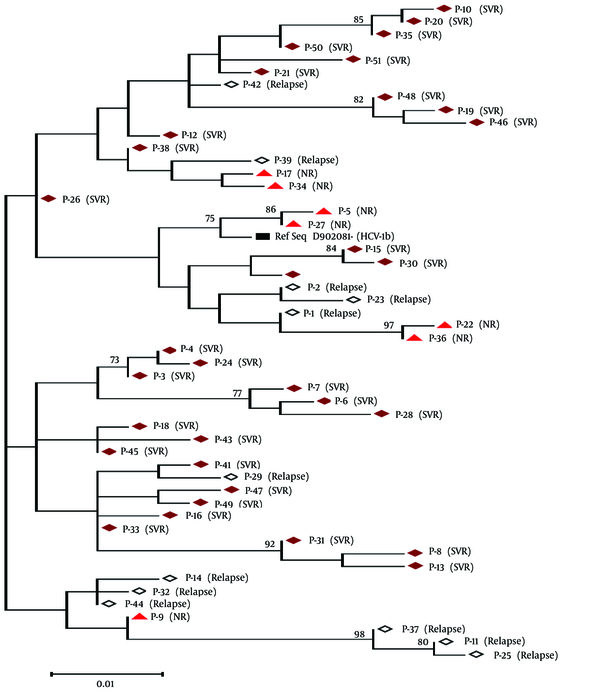 A phylogenetic tree was labelled with patient numbers and responses to the Peg-IFNα-2a/RBV treatment. It is noteworthy that most of relapsers are clustered in one of the clades (Figure 2). No clustering was observed in other sequences, according to treatment response. Twelve (23.5%), thirty-six (70.6%) and three (5.9%) out of fifty-one patients possessed, respectively, the CC, CT and TT genotypes of IL28B rs12979860. Interestingly, all of the homozygous CC patients achieved SVR, whereas TT homozygous patients were found exclusively in relapsers. Twenty out of thirty-six CT heterozygous patients (62.5%) showed SVR. It is noteworthy that the CC genotype was associated with SVR (P = 0.009), while the TT genotype was associated with a relapse response (P = 0.006) (Table 3). It is known that host factors (e.g. IL28B polymorphisms, innate immunity) and viral factors (e.g. HCV genotypes, amino acid variation in the HCV core and NS5A regions) might affect the outcome of the Peg-IFNα-2a/RBV combination therapy (17, 25-27). Analysis of various regions of the HCV genome has shown differences in amino acid residues between non-responders and responders to HCV treatment (28). Several studies indicate that amino acid substitutions at positions 70 and 91 of the core region represent important pre-treatment factors associated with virological non-response to Peg-IFNα-2a/RBV combination therapy. In particular, substitutions of arginine (R) with glutamine (Q) at position 70 (R70Q) and/or leucine (L) with methionine (M) at position 91 (L91M) were significantly common in virological non-responders (8). In the present study, the occurrence of the R70Q substitution in the core region was significantly higher (P < 0.001) in non-responders and relapsers than in the rest of the patients. Similarly, a significant association between the R70Q substitution and the outcome of the Peg-IFNα-2a/RBV combination therapy in non-responders patients infected with HCV-1b has been reported by several previous studies (12, 23, 29, 30). Additionally, several reports indicated that the frequency of substitutions in the core residue at position 91 was significantly higher in non-responders than in responders or relapsers (12, 29). It is noteworthy that in this study, a significant correlation was observed between the outcome of Peg-IFNα-2a/RBV combination therapy and the L91M substitution (P = 0.037). Therefore, it seems that the core 70 and 91 polymorphisms can be used as pre-treatment factors to predict the response to the Peg-IFNα-2a/RBV combination therapy. Overall, the results obtained in this study indicate that core variability might influence the treatment response in Azerbaijani patients. Interestingly, in the present study, a significant association was observed between the amino acid substitution at position 43 of the core (R43K) and HCV non-response and relapse (P = 0.047). A significant association was also seen between the amino acid substitution at position 106 of the core (S106N) and HCV SVR (P = 0.018) after Peg-IFNα-2a/RBV combination therapy. It should be noted that these correlations have never been reported in previous reports. Therefore, it appears that the polymorphism at position 43 of the core can most likely be a useful pre-treatment predictor of HCV non-response and relapse, while the polymorphism at position 106 of the core can most likely serve as a useful pre-treatment predictor of HCV SVR after Peg-IFNα-2a/RBV combination therapy in patients infected with HCV-1b. However, more studies should be conducted to confirm this association. Earlier studies have shown that the HCV core region may be related with resistance to the antiviral effects of IFN, which mediates the Janus kinase-STAT (JAK-STAT) signalling cascade (31-33). This study found that amino acid substitutions in the HCV-1b core region may be used to predict the virological non-response to the Peg-IFNα-2a/RBV therapy by HCV-1b infected patients. Thus, the data obtained from the present study suggest that substitutions in the HCV-1b core counteract the IFN antiviral effects. Nevertheless, more studies are needed to determine the functional and structural impact of amino acid substitutions at position 43, 70, 91, and 106 of the core during the Peg-IFNα-2a/RBV therapy to confirm the above finding. Interleukin 28B is a Type 1 helper (Th1) cytokine that belongs to the type-III IFN family, a class-II cytokine receptor ligand, and also named IFN-k. IL-28B plays an important role in the regulation of interferon-stimulated gene (ISG) expression (34, 35). It is produced by dendritic cells, as well as PBMCs, upon viral infection. It is recognized that IL-28B exhibits antiviral activity and has an effect on the natural clearance of HCV (36). This study was conducted to assess the effect of rs12979860, a SNP located near IL28B, on the outcome of Peg-IFNα-2a/RBV combination therapy. Consistent with previous studies (15, 16), the frequency of the IL28B CC genotype in responders was significantly higher (37.5%) than the CT (0.0%) or TT (0.0%) genotypes (P = 0.009). Thus, it seems that the rs12979860 C allele confers some advantages in terms of response to the Peg-INFα-2a/RBV combination therapy against HCV infection. Overall, these data indicate that host genetics might be useful for predicting treatment response to HCV infection (16). In conclusion, the current study has demonstrated that amino acid substitutions at position 43, 70, 91, and 106, of the HCV-1b core region and the rs12979860 polymorphism (located 3 kb upstream of IL28B) are associated with the outcome of Peg-IFNα-2a/RBV combination therapy in Azerbaijani patients with chronic HCV infection. In general, it is notable that the amino acid residue sequence in the HCV-1b core region and the IL28B allelic pattern play important roles in determining the response to Peg-IFNα-2a/RBV combination therapy. We would like to thank all the candidates who generously enrolled in the present research. Authors’ Contribution: Farah Bokharaei-Salim and Hossein Keyvani designed the present study and were responsible for the overall management of the study; Farah Bokharaei-Salim, Mostafa Salehi-Vaziri, and Farzin Sadeghi organized the analysis of the study; Farah Bokharaei-Salim, Mostafa Salehi-Vaziri, Farzin Sadeghi, Maryam Esghaei, Seyed Hamidreza Monavari, Seyed Moayed Alavian, and Hossein Keyvani prepared the manuscript. The statistical analyses were conducted by Farah Bokharaei-Salim, Mostafa Salehi-Vaziri, Farzin Sadeghi, and Shahin Fakhim. All authors contributed to the final version of the manuscript. Conflict of Interest: The authors declare no conflict(s) of interest. Financial Disclosure: The authors have no financial disclosures to express and no conflicts of interest to report. Funding/Support: This study was supported by the research deputy of the Iran University of Medical Sciences, grant number 23418.